In the United States, most people consider the end of summer to be Labor Day. Lots of families choose to make a road trip over this long holiday weekend. All of those people on the road make for higher chances that you will be involved in a car wreck. One of the results from those car wrecks is death. According to AAA statistics, Labor Day weekend is the second highest amount of deaths from car wrecks and truck wrecks in the United States. Memorial Day is deadliest with the highest number of deaths and injuries and July Fourth is in third place. When looking at the number of injuries and deaths from car wrecks, summertime accidents happen the most over the big 3 summer holidays. 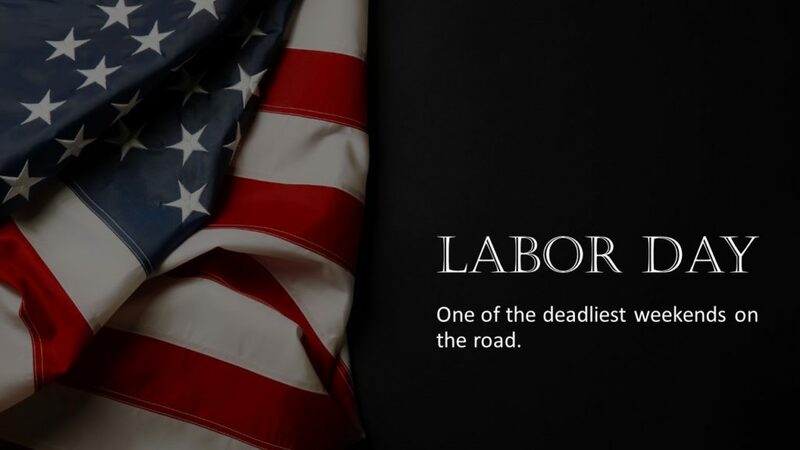 It is estimated that there will be more than 300 deaths in the United States from car and truck wrecks over the Labor Day weekend. Injuries from car wrecks and truck wrecks over Labor Day weekend will add up to over 40,000 hurt. Many of these car wreck injuries and deaths are due to negligent driving and distracted drivers. Three common reasons that you could be injured and/or a loved one killed in a car wreck or truck wreck are other drivers texting and not paying attention to the road, distracted driving (other than texting), and driving under the influence from alcohol or drugs. Negligent and impaired driving and the two biggest causes of death and injury to a motorist. Texting drivers are distracted drivers. A driver takes their eyes off the road for an average of 50 seconds when sending or getting a text. That is more than enough time to cause a car wreck or truck crash that injures another driver. Texting while driving is the number one cause of wrecks. Distracted driving (not counting texting) is the number two cause of car crashes. Putting on makeup, answering a mobile phone call, a crying baby, a teenager playing around, and eating your lunch are all things that drivers do that make them a distracted driver. Anything that takes a drivers’ attention and mind off the road is distracted driving and it leads to car wrecks, injuries, and even death. Driving while under the influence is the third reason that accidents happen over the busy holiday weekend like Labor Day. Alcohol and drugs are neck-in-neck when it comes to the number of car wrecks caused by someone under the influence of a mind-altering substance. Be a safe driver this Labor Day weekend. If you need to send or read a text, pull over and stop. Better to communicate safely than not be able to communicate ever again. Limit distractions in the car. Have another passenger that will take care of kids, adjust the air conditioning, and be a second pair of eyes as you navigate the roads on the way to your destination. Have a designated driver. Make plans before you celebrate to make sure you can arrive home safe after holiday weekend travels. Not every person driving a car or truck during the Labor Day weekend will practice safe driving. If you are the victim of a negligent driver, get the best representation from a local lawyer who cares. N. Craig Richardson has decades of experience, a dedicated legal team, and will fight to get you the settlement you deserve from the insurance company. Call for a free, no-obligation consultation today.